In last night’s disappointing defeat to Fulham, three young players staked their claims for regular first team football this season. Romelu Lukaku is already an internationally renowned centre forward and will in all likelihood lead the Everton line for the remainder of the season. Gerard Deulofeu brings with him a huge reputation, a Barcelona graduate and another star of the future. One player, however, who very few will know outside Everton and Barnsley, is young centre back, John Stones. John Stones, in two first team starts, has already done enough to convince many experts, that he has an incredibly bright future in the game. At just 19-years-old, Stones plays with a maturity, way beyond his years. He is incredibly composed in possession of the ball, an essential ingredient to be successful in a Roberto Martinez team; he is versatile and currently represents England u21s at right back and has a tremendous ability to read the game, anticipating situations and ensuring he is well positioned to intercept the opposition. At 6ft 2inches tall, Stones has the perfect height for a central defender, he could certainly do with putting some extra weight on to fill out his frame, but he is not afraid to get stuck into a challenge and his slender frame does not affect his ability to make an immediate impact in the Premier League. After an impressive introduction to his Everton career, he has jumped ahead of John Heitinga and Shane Duffy, to be next in line for a central defensive birth at the Blues. Martinez would have no doubts in putting him into the team and he will surely be pressurising Sylvain Distin and Phil Jagielka for a starting role before the season is at an end. Speaking to evertonTV Martinez has been quick to praise the Yorkshire born centre back. “In my eyes, he’s the most promising young English centre-half that we have in the country. “I always said that he would play for England at senior level. He will have a terrific career; it’s just a matter of shaping up, taking things in, being able to make mistakes and correct them. “I expect big things from him but we need to allow him to develop and enjoy his football. “I followed John really closely when he was at Barnsley and I always thought he had incredible potential for someone that can play in different positions and adapt to systems. At such a young age, he has such a mature personality. “He would have been an asset for any football club – Everton at that time were very fortunate to get John because I see him as an outstanding prospect for the future. 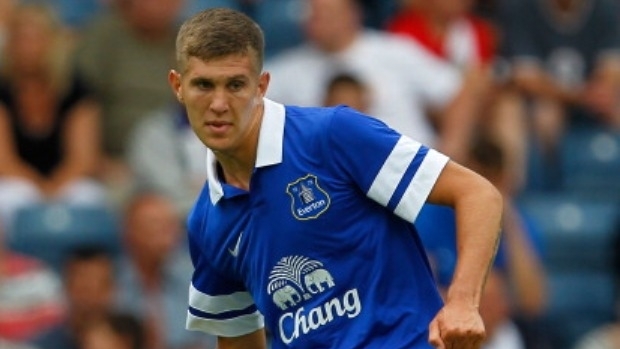 John Stones jumped to the attention of most Evertonians after a strong pre-season campaign. The pinnacle of which was a brilliantly taken penalty which helped Everton overcome Italian Champions Juventus. The penalty perfectly demonstrated his composure in pressurised situations and Evertonians will be looking forward to seeing John Stones impressing for Everton for a number of years to come. Please let us know your thoughts on John Stones? Should he be starting for the Blues? Where do you see his future?